Is there such a thing as luck in life, or do we create our own luck? Perhaps the "lucky" man works harder, or smarter, or has the knack, or the courage, to seize an opportunity. The lucky girl realizes a man is a great catch and goes for it while the "unlucky" girl sees only a loser with no hope and lets the very same man slip away. And then she whines, "Why aren't there any decent men out there!". There are, but you need to be "lucky" to notice them. And then there is the concept of "Beginners luck". Some people "rely" upon beginners luck, but I think this is nonsense. Last night I had some insight into beginners luck. I believe it is the absence of stress created by trying too hard. Sometimes we can be our own worst enemies, we stand in the way of our own success. We need to remove those obstacles which we create. Some beginners have not created obstacles. 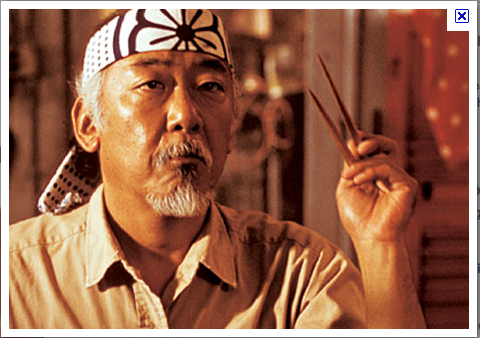 Mr. Miyagi and his famous chopsticks, a generation of martial artists grew up on this classic film. "Daniel San, you beginners luck!" The classic film, The Karate Kid with the late great Noriyuki "Pat" Morita and Ralph Macchio inspired a generation of martial artists and filled karate schools with new students. In that film one of the classic scenes finds Mr. Miyagi meditating while trying to catch a fly with chopsticks. Daniel walked in and saw him. Daniel asks "Would'nt a fly swatter be easier?" Mr. Miyagi: Man who catch fly with chopsticks accomplish anything." Daniel: Did you ever catch one? Daniel picks up a pair of chopsticks and joins Mr. Miyagi in this activity and succeeded, to which Mr. Miagi said "you beginner luck." But was it beginners luck? Flashback a few years, Krav Maga Tour and Train, the early days...a young woman, petite, wins our shooting competition. She hits five balloons with her 9 mm while her tall and muscular boyfriend and other similar macho guys score a cool zero. I ask our shooting instructor, "Did you see this coming?" he said, "Yes, it happens all the time. As soon as she hit the first balloon I knew it would end this way. " He explained; the "tough guys" had something to prove, they had to win. Shooting well was part of their "manliness" but no one had any expectations of a cute little petite blonde. Once she hit the first shot, well, she already exceed everyone's expectations. Now she certainly had nothing to prove. Having nothing to prove makes us more relaxed. She was totally relaxed and was thinking "Wow, this is so much fun". Fun?!? The guys were visibly stressed. I do not care what year it is, men are men and these men, in particular the boyfriend, simply had to be the better shot. Last night a new student came in, sweet little girl, petite, about 11 years old. We were working on defense when a handgun is touching your forehead. I developed a technique for this situation which I like very much. It is different from other styles of Krav Maga. It involves stepping out of the line of fire immediately and using an down-up chopping motion on the attackers' arm. I fully believe in this technique and those that have learned it properly believe in it as well. But some...have difficulties. I have seen black belts, experienced instructors, struggle with this technique for months and ultimately reach the conclusion that "Moshe goofed on this one". So they either "improve upon it" or drop it. I try to teach them, relax, flow, take it easy and you will see how this is an amazing technique, once you get it you will swear by it. Trust me on this one. So last night this little girl tries it for the first time and....perfect! I told her she is doing it better than black belts. Perhaps she thought I was just being nice. I never flatter students just to be nice. Not happening. She was doing it great. Perhaps it was "beginners luck" but I do not believe in that. What is beginners luck? It is this feeling that you are free from expectations. No one is expecting you to do great your first lesson, you are free to make mistakes and no one will criticize you. This is a luxury not afforded more advanced students. So nothing is expected of you, and you are totally relaxed, and bam...you did it perfectly. Those who get nervous put in too much effort, too much pressure and they perform badly. And then the corrections they receive place even more stress. Bad cycle. So there is no beginners luck, there is just that Wu Wei, the effortless effort. When asked what is the difference between where I am now and where I was five years ago I jokingly say I have become more Chinese. What I mean is I flow more, I am more relaxed, I use less effort in my Krav Maga techniques. What we need to cultivate in the higher ranks is that same attitude as the beginner. To be the Child again. As Bruce Lee said we go from Child to Man to Child. Free yourself from ego, from stress and just allow the technique to happen. We have a lot to learn from beginners. With IKI Krav Maga Beginners are always welcome, you are a breath of fresh air. As Mr. Miyagi said, "To make honey, young bee need young flower, not old prune." Very astute observations. I totally agree. Learned a long time ago that if you relax things work much better for you. I guess also being older, more tired and more experienced allows one to relax a bit. I also think that once one gets to the point where he/she is not afraid to mess up in front of students, instructors, friends, etc., many things become easier and work better. All pretty much the same concept you outline. My response: That is not really what I meant. Difficult to put into words. Tensing up ruins all the techniques. People train wrong, have bad habits, everything turns out wrong and incorrect. They never fully "get" the idea and thus never fully appreciate the techniques. When you do not appreciate a technique you can never do it well, because without confidence the technique will never be correctly executed. Like the technique I am describing, gun touching the head, many have trouble with this at first because they try too hard and they ruin it. I do it totally relaxed and when I "mean it" I do it even faster and harder and it works amazing. I see the shock and pain on the opponent. I believe in this. My tension, aggression, etc does not tense up the technique but rather makes it work faster, more powerful. Learning to do it relaxed makes it more effective and when you do it "for real" it is even more effective. Take shooting for example, every shot must be relaxed but yet Counter Terrorists are certainly not relaxed when in combat. Contradiction? No. They train to shoot relaxed because if they force the trigger the shots will not be accurate, and accurate they must be or they will kill innocent civilians. So the situation can be not relaxed but the technique is relaxed. The actual fight will not be relaxed of course but imagine tensing up with every punch? The tense punch does not work. It is slow and weak. That is why fighters always loosen up before a boxing match. The punch without tension is much faster and more powerful than the "forced" punch.This does not mean the fighter is relaxed and taking it easy during the fight. When I am in a fight I flow. This is how I trained and it works. My "tension" does not cause me to tense up but to flow even more. I never really looked at "beginners luck" in this way. it makes sense. Also, women actually make better shots than men. there are several studies that have proven this. one of the best snipers in Russian history was a women. Lieutenant Pavlichenko, her total confirmed kills during World War II was 309,including 36 enemy snipers. Besides, she became an instructor and trained Soviet snipers until the war's end.